23 representatives from different districts in Beijing, China, interested in learning more about circular economy visited Swedish Entrepreneurship Forum. 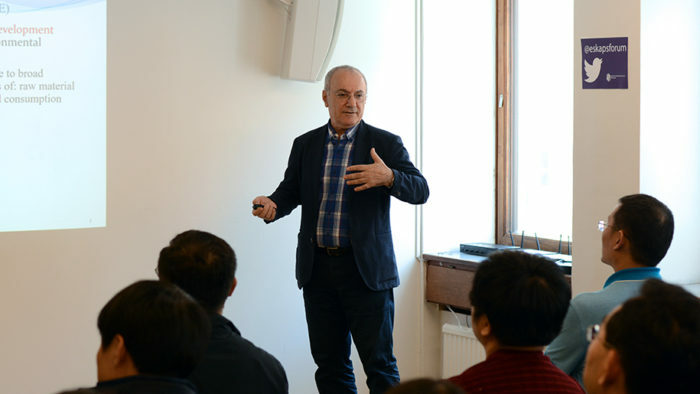 Almas Heshmati, Professor at Sogang University, Seoul, Korea, and Jönköping International Business School, presented the report “A Review of the Circular Economy and its Implementation in China, Sweden and Europe”. Almas Heshmati described circular economy as a strategy for sustainable development aimed at addressing environmental pollution and resource shortages. The circular economy is a shift from small waste management to wide efficiency-oriented control in all phases of raw material extraction, production, distribution and consumption processes. It’s about three R principles: Reduce, Reuse and Recycle, said Almas Heshmati, adding that the principles represent a circular system where all materials are recycled, all energy comes from renewable energy sources and where different activities support and build the ecosystem as well as people’s health and a healthy society. The report raises China as an example of a country that has officially adopted circular economy as a policy tool for measuring resource use and development. Heshmati said, however, that China’s positive figures in the area may not always describe what it looks like in reality. He presented the structure of circular economy in China at micro, meso and macro levels and how this work can be evaluated and measured. Almas Heshmati also emphasized entrepreneurship as an important driving force for economic growth, breakthroughs of innovation and job creation. Sustainable entrepreneurship is about discovering and exploiting financial opportunities in connection with market failures where activities can be run more environmentally and socially sustainable. Among policy recommendations to succeed in a sustainable development strategy, Almas Heshmati proposed reforms of environmental legislation, urban planning, and policy measures to increase product life and service life as key components. He also raised the need for improved awareness among companies, employees and consumers as important for circular production, consumption and waste management.